NO HOA!!! This beautiful pool home located in cul-de-sac in Lorraine Estates Subdivision offers 3 bedrooms, 2 full bathrooms with over 2100 sq ft under A/C. Living room is open to the dining room which is great for entertaining family and friends. Kitchen offers breakfast bar, appliances, lots of cabinets and counter top space. Right off the dining room is the Florida Room with lots of storage space. Master Bedroom offer walk in closet and shower. One room can be used as office or den and next room over is the family room. 3rd bedroom offers huge walk-in closet with private door leading to the back patio. Features are thermal pane windows, carpet and tile flooring throughout, track lighting, ceiling fans, and much more. Covered side porch. Spacious fenced in backyard with heated pool and spa plus outdoor shower to rinse off. Aqua Rite Salt Chlorinator, Hayward Echo heat pump, heavy duty solar blanket with spare in rear shed. 2 sheds with power and one with window A/C unit. Yard has full irrigation w 2 hp pump. Power pole for boat or trailer. This home has so much to offer. 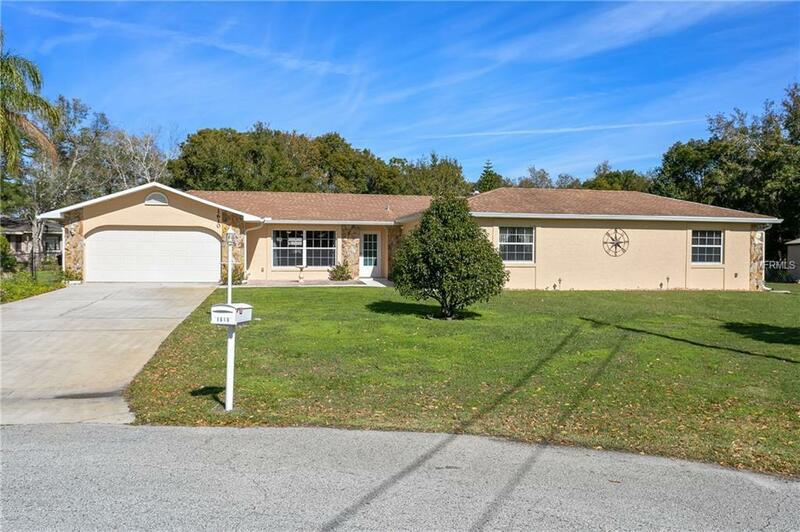 Close to schools, shopping, restaurants, major hwy and much more. THIS HOME HAS A LOT MORE TO OFFER SO CALL TODAY TO SCHEDULE A SHOWING. THIS HOME WILL NOT LAST! !